Parks and Recreation is an American situation comedy created by Greg Daniels and Michael Schur. The show premiered on NBC on April 9, 2009 and concluded on February 24, 2015 after airing seven seasons. The series stars Amy Poehler as Leslie Knope, an ambitious, mid-level bureaucrat working in the Parks and Recreation Department of Pawnee, a fictional town in Indiana. The sitcom features an ensemble cast, including Rashida Jones, Aziz Ansari, Nick Offerman, Aubrey Plaza, Chris Pratt, Adam Scott, Rob Lowe, Paul Schneider, Jim O'Heir and Retta, among others. The show was nominated for a variety of different awards throughout its run, including sixteen Primetime Emmy Award nominations, twice as a comedy series and twice for writing. Parks and Recreation was also nominated for fifteen Critics' Choice Television Awards (three wins), two Art Directors Guild Awards, four Golden Globe Awards (one win), a Peabody Award (one win), a Producers Guild of America Award, five Satellite Awards, and five Writers Guild of America Awards, among other awards. The ADG Excellence in Production Design Award is presented each year by the American Art Directors Guild to recognize the best production design and art direction in the film and television industries. Parks and Recreation was nominated twice. The AFI Award, created in 2000 by the American Film Institute, is given annually to ten films and ten television programs to acknowledge the "most significant achievements in the art of the moving image". Parks and Recreation was honored in 2011. The American Latino Media Arts Award, or simply ALMA Award, is an accolade presented annually to acknowledge the best American Latino contributions to film, music, and television. Plaza received two nominations. The American Comedy Awards recognize the best work in comedy. The accolade is given to television programs, films or individuals. Parks and Recreation has two wins from four nominations. The Cinema Audio Society Awards honor the outstanding achievements in audio mixing. Parks and Recreation has three consecutive nominations. The Critics' Choice Television Award is an annual accolade given by the Broadcast Film Critics Association since 2011 in order to recognize the most significant achievements in television. Parks and Recreation has three wins out of fifteen nominations. 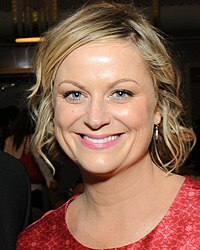 Poehler received six consecutive Primetime Emmy Award nominations for portraying Leslie Knope. The Emmy Awards were established in 1949 in order to recognize excellence in the American television industry, and are bestowed by members of the Academy of Television Arts & Sciences. Emmy Awards are given in different ceremonies presented annually; Primetime Emmy Awards recognize outstanding work in American primetime television programming, while the Creative Arts Emmy Awards are presented to honor technical and creative achievements, and include categories recognising work of art directors, lighting and costume designers, cinematographers, casting directors, and other production-based personnel. Parks and Recreation has sixteen nominations without any wins. Poehler was nominated for the best actress six times in a row for playing Leslie Knope with an additional nomination in 2012 for writing. Michael Schur has a nomination for writing in the same year as well. Parks and Recreation has two nominations for the best comedy series. The show has four further nominations for its sound mixing and a nomination for a short-format program for NBC.com series entitled Parks and Rec in Europe. The GLAAD Media Award, established in 1990 by the American Gay & Lesbian Alliance Against Defamation, is given in order to "recognize and honor media for their fair, accurate and inclusive representations of the LGBT community and the issues that affect their lives." Parks and Recreation won once. The Golden Globe Award, founded in 1943, recognizes the best work in both film and television. The accolade is given by the members of the Hollywood Foreign Press Association (HFPA). Parks and Recreation received four nominations with Poehler winning once in 2014. The Gracie Award was established in 1975 by the Alliance for Women in Media to recognize the best representation of women in the media. The award is given to various types of programming or individuals. Parks and Recreation has two wins. Plaza, who portrays April Ludgate in the series, was nominated for an Imagen Award four times. The Imagen Award is organized by the Imagen Foundation, an American organization dedicated to "recognize and reward positive portrayals of Latinos in all forms of media". Plaza was nominated four times. The NAACP Image Award, presented annually by the American National Association for the Advancement of Colored People, was established 1967 in order to honor people of color for their work in film, television, music, and literature. The series has two wins out of six nominations, both won by Ken Whittingham for directing. The Producers Guild of America Award is bestowed by the Producers Guild of America to honor the work of producers in film and television. Parks and Recreation has one nomination. The Satellite Award is given annually by the International Press Academy (IPA) to honor the best work in the entertainment industry. Poehler received three nominations while Parks and Recreation was nominated once as a series. The Screen Actors Guild Award, given by the Screen Actors Guild‐American Federation of Television and Radio Artists (SAG-AFTRA), is an award dedicated to honor the best performances of actors in film and television. Poehler received three nominations. First presented in 1949, the Writers Guild of America Award recognizes the work of film, television and radio screenwriters. Parks and Recreation was nominated five times between 2012 and 2014, including three times for the best series and twice for an individual episode. ^ a b c Awards in the categories do not have prior nominations and only winners are announced. For simplification and to avoid errors, each award in the list was presumed to have had a prior nomination. ^ The award is shared with Zooey Deschanel for New Girl. ^ Berkshhire, Geoff (January 13, 2015). "'Parks and Recreation' Boss On the Show's 12 Biggest Turning Points". Variety. Retrieved May 18, 2016. ^ "About Parks and Recreation & Cast Bios". NBCUniversal. Archived from the original on May 6, 2016. ^ Wolfe, Jennifer (February 2, 2015). "'Grand Budapest Hotel,' 'Birdman,' 'Guardians' Top 19th Annual ADG Awards" (Press release). Animation World Network. Archived from the original on February 5, 2015. ^ "17th Annual ADG Award Winners & Nominees". Art Directors Guild. Archived from the original on March 26, 2016. ^ "18th Annual ADG Award Winners & Nominees". Art Directors Guild. Archived from the original on April 22, 2016. ^ "About AFI Awards". American Film Institute. Archived from the original on April 17, 2016. ^ Vary, Adam B. (December 11, 2011). "AFI's top 10 TV shows: 'Game of Thrones,' 'Louie' in; 'Glee' out". Entertainment Weekly. Archived from the original on April 19, 2015. ^ Neese, Joseph (October 10, 2014). "ALMAs to pay tribute to 15 years of Latino contributions to US culture". MSNBC. Archived from the original on March 4, 2016. ^ Powers, Lindsay (July 29, 2011). "The show, co-Hosted by Eva Longoria and George Lopez, will air live on NBC on Sept. 16". Entertainment Weekly. Archived from the original on December 22, 2015. ^ Terrero, Nina (September 21, 2012). "ALMA's Winners and Losers". NBC News. Archived from the original on September 23, 2012. ^ Goldberg, Lesley (October 23, 2013). "NBC Revives American Comedy Awards (Exclusive)". The Hollywood Reporter. Archived from the original on January 18, 2016. ^ Reiher, Andrea (May 8, 2014). "American Comedy Awards". Screener. Archived from the original on May 4, 2016. ^ a b "Cinema Audio Society Awards: A complete list of winners and nominees". Los Angeles Times. January 14, 2014. Archived from the original on April 18, 2016. ^ "The Cinema Audio Society announces the nominees for the 51st Annual CAS Awards". Cinema Audio Society. January 13, 2015. Archived from the original on April 12, 2016. ^ Lincoln, Ross A. (January 12, 2016). "'Hateful Eight', 'Revenant', 'Star Wars', 'Mad Max' Among Cinema Audio Society Nominees". Deadline Hollywood. Archived from the original on March 9, 2016. ^ Keveney, Bill (June 20, 2011). "'Mad Men,' Hamm take Critics' Choice Television Awards". USA Today. Archived from the original on December 23, 2015. ^ Andreeva, Nellie (June 6, 2011). "'Modern Family', ABC Lead Nominations For Inaugural Critics' Choice Television Awards". Deadline.com. Archived from the original on May 2, 2016. ^ "Critics' Choice TV Awards: 'Homeland', 'Community' & 'Sherlock' Double Winners". Deadline.com. June 18, 2012. Archived from the original on May 5, 2016. ^ "Broadcast TV Journalists Association Unveils Critics' Choice Television Awards Nominees". Deadline.com. May 28, 2014. Archived from the original on March 6, 2016. ^ "About the Academy". Academy of Television Arts & Sciences. Archived from the original on April 2, 2016. ^ "62nd Emmy Awards Nominees and Winners". Academy of Television Arts & Sciences. Archived from the original on March 26, 2016. ^ a b c "63rd Emmy Awards Nominees and Winners". Academy of Television Arts & Sciences. Archived from the original on March 26, 2016. ^ a b "64th Emmy Awards Nominees and Winners". Academy of Television Arts & Sciences. Archived from the original on March 26, 2016. ^ a b "65th Emmy Awards Nominees and Winners". Academy of Television Arts & Sciences. Archived from the original on March 26, 2016. ^ a b "66th Emmy Awards Nominees and Winners". Academy of Television Arts & Sciences. Archived from the original on March 26, 2016. ^ a b "67th Emmy Awards Nominees and Winners". Academy of Television Arts & Sciences. Archived from the original on March 26, 2016. ^ "Gay & Lesbian Alliance Against Defamation: Media Awards". Gay & Lesbian Alliance Against Defamation. Archived from the original on January 18, 2016. ^ Ram, Archana (March 14, 2010). "'Brothers and Sisters' and 'Parks and Recreation' among winners at GLAAD Media Awards". Entertainment Weekly. Archived from the original on January 22, 2011. ^ "The Golden Globes – Trivia". Hollywood Foreign Press Association. Archived from the original on April 1, 2016. ^ "Golden Globes 2012: The Winners List". The Hollywood Reporter. January 15, 2012. Archived from the original on March 3, 2016. ^ "Golden Globes 2013: full list of winners". The Guardian. January 14, 2013. Archived from the original on March 5, 2016. ^ Tapley, Kristopher (January 12, 2014). "71st Golden Globes winners and nominees – complete list". HitFix. Archived from the original on April 6, 2016. ^ "Advancing Women in Media – About". Advancing Women in Media. Archived from the original on May 17, 2016. ^ Grossberg, Josh (February 27, 2013). "Lena Dunham, Amy Poehler, Julianne Moore and Robin Roberts Snag Gracie Awards". E! News. Archived from the original on June 18, 2013. ^ "The Imagen Awards: Premier Latino Entertainment Awards". The Imagen Foundation. Archived from the original on March 8, 2016. ^ "25th Annual Imagen Awards – Winners & Nominees". The Imagen Foundation. Archived from the original on March 9, 2016. ^ "27th Annual Imagen Awards – Winners & Nominees". The Imagen Foundation. Archived from the original on May 14, 2016. ^ "28th Annual Imagen Awards – Winners & Nominees". The Imagen Foundation. Archived from the original on March 23, 2016. ^ "29th Annual Imagen Awards – Winners & Nominees". The Imagen Foundation. Archived from the original on March 23, 2016. ^ "NAACP Image Awards". National Association for the Advancement of Colored People. Archived from the original on April 26, 2016. ^ "The 44th NAACP Image Award complete winners list". Los Angeles Times. February 1, 2013. Archived from the original on March 5, 2016. ^ Couch, Aaron; Washington, Arlene (February 22, 2014). "NAACP Image Awards: The Winners". The Hollywood Reporter. Archived from the original on March 13, 2016. ^ Washington, Arlene (February 6, 2015). "NAACP Image Awards: The Winners". The Hollywood Reporter. Archived from the original on April 27, 2016. ^ "The Peabody Awards – Who We Are". The Peabody Awards. Archived from the original on April 29, 2016. ^ "The Peabody Awards – Parks and Recreation (NBC)". The Peabody Awards. Archived from the original on March 4, 2016. ^ Judkis, Maura (April 4, 2012). "'Game of Thrones,' CNN, Jeopardy among Peabody winners". The Washington Post. Retrieved May 17, 2016. ^ a b "PGA Announces Theatrical Motion Picture And Long-form Television Nominations For 2012 PGA Awards". Producers Guild of America. January 3, 2012. Archived from the original on April 2, 2016. ^ "About the IPA". International Press Academy. Archived from the original on March 22, 2016. ^ "Past Winners – 2011". International Press Academy. Archived from the original on April 29, 2016. ^ "Past Winners – 2012". International Press Academy. Archived from the original on March 22, 2016. ^ "Past Winners – 2013". International Press Academy. Archived from the original on March 14, 2016. ^ "Past Winners – 2015". International Press Academy. Archived from the original on March 20, 2016. ^ "Screen Actors Guild Award – About". SAG-AFTRA. Archived from the original on April 19, 2016. ^ "SAG Awards 2013: Complete List of Winners". The Hollywood Reporter. January 27, 2013. Archived from the original on December 21, 2015. ^ Zuckerman, Esther (January 25, 2015). "TSAG Awards 2015: The winners list". Entertainment Weekly. Archived from the original on May 9, 2015. ^ "Screen Actors Guild Awards 2016: Complete list of winners and nominees". Los Angeles Times. January 30, 2016. Archived from the original on May 5, 2016. ^ "Writing Awards Database". Writers Guild Foundation. Archived from the original on May 7, 2016. ^ Fernandez, Jay A. (February 19, 2012). "Writers Guild Awards: Complete Winners List". The Hollywood Reporter. Archived from the original on January 31, 2016. ^ "Previous Nominees & Winners". Writers Guild of America, West. Archived from the original on March 28, 2016. This page was last edited on 1 July 2018, at 12:45 (UTC).